I totally agree. Great article Ryan. Thanks for the alternatives. Never been a fan of the gauge for the reasons you state. I am glad we now have the option of using bullet charts to replace this antiquated visualization. I completely agree. We used to have an old saying, “Gauges sell dashboards!” and it was true. Every Exec would be gaga eyed when we presented our demo’s but in practive I only ever used a gauges when the client absolutely insited on having them. Why stop at guages? Yes, they are arguably the worst method for displaying single values, but why do so many Xcelsius dashboards still utilize the very popular but ineffective pie chart? 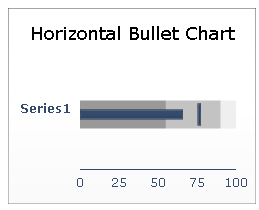 A colleague recently gave me Information Dashboard Design by Stephen Few – He states that the bullet graph achieves the communication objective without the problems that usually plague gauges and meters. (Just noticed the link on the right!) Plenty of reading material for me there, so thanks for all the useful links. I do not agree with Ryan! 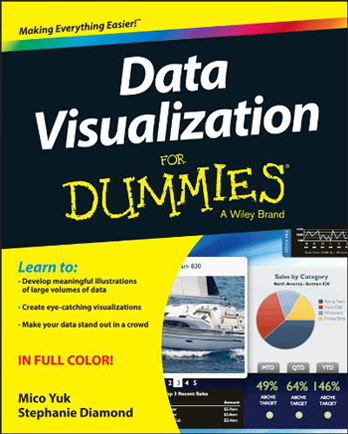 In the field of visualisation market research data, we use the gauge a lot because its the only component which can present different kind of data/information in a intuitive way! For example: we use one(!) gauge component to present the following data: a net score presented by the needle; top2 and bot2-scores presented by two inside markers, benchmark scores presented by outside markers, outcomes of statistical tests of significance presented by the color of the needle/center color and reliability bounderies presented organised by alerts. 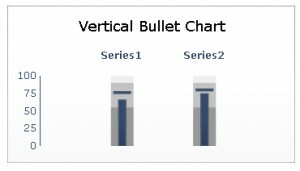 There’s no other component around there, including the bullet charts, which can do this job better than the gauge! So in my opinion: the gauge is alive and kicking, especially in more advanced data visualisations!! Unfortunately, I am not familiar with your line of market research scoring/reporting, but your creative application of color and multiple gauge markers sounds interesting. In your case there is no arguing that you are maximizing the real estate that a gauge consumes. Without understanding the entire data set, how it is calculated and how your score is to be interpreted by an end user, I can only take your word that you thoughtfully investigated all options and found the gauge to be most effective. I assume that if Xcelsius is your dashboard development tool of choice, your assessment is probably correct because Xcelsius does not provide good statistic visualization components. Only your dashboard end users can indicate how effective the gauge design is, which can be measured by adoption/usage, and their satisfaction with the speed and ease for assimilating the information. You very well may have a useful case on your hands, though I have found that gauges with lots of visual elements and colors can can quickly overload users. The best way to find out if dashboard end users really get it, is to ask them to demonstrate and explain the dashboard to someone who has never seen it. Our biggest problem is Xcelsius does not provide visualization for statistical analysis like the box plot or advanced x,y charts. Even without good statistical charting, I would say that 95% of the gauges that I have ever looked at in Xcelsius dashboards can quickly and easily be replaced with a label, table, or charts. thanks for the comments and sharing your use case. While I agree with the gist of this, I’m not sure that gauges are completely dead. Gauges/speedos are the indicators that almost everyone is most familiar with, especially if they can be made to look attractive. The main issue with the gauge, that of screen real estate, can be solved by an ability to scale or hide the component as required. 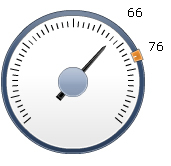 We’re starting to see a variety of Xcelsisus users adding gauges, for example, onto a draggable popup. The gauges do not need to function solely as indicators – they can be deployed to drive data values in the dashboard, e.g. targets. Once finished, the popup can be removed. Or alternatively, a user can have the capability of scaling the size of the gauge using another component like a slider. While I agree with the stated limitations of the guage, I have not found the highly-praised bullet chart to be easily and intuitively understood by anyone I have tried to use it with. You have three color ranges and two value indicators. How do you effectively communicate what all this is? The series label does not clearly identify which component is which and the only way to create a legend is to laboriously construct it by hand, as Xcelsius provides no legend option for the bullet chart. Once you explain it to them they understand but its a struggle, whereas people tend to pick up on the guage very quickly, maybe because its a construct we’re all used to in everyday life. Additionally, when displaying real-time operational data from a processing plant, the guage seems to provide an appropriate contextual metaphor, as opposed to using it for some type of financial performance metric. I have found that especially in the case of data like flow rates and operating pressures, the bullet chart seems even more removed from the context of what people are looking at, even if it ultimately is a better communications tool.